If someone were to ask my sister Marcela why she migrated, she would smile and say she moved for love. “I met the love of my life in Honduras 8 years ago. A friend of mine introduced me to my now husband.” Connor and Marcela’s love story often sounds like something that would sell in paperback at the grocery store. He was a U.S. Marine who didn’t speak Spanish. She was a Honduran woman who didn’t speak English. She didn’t think they had a connection and decided they wouldn’t go out again, but a few months later, he messaged her and asked if she would see him. She thought it through, said yes, and that was it. They rekindled their romance with a night of dancing. Navigating the relationship was still challenging in terms of communication. “It was still awkward in the beginning, but we had something special that even though we couldn’t talk that did not stop us from being together.” As their relationship grew, she worked on picking up the English language and his Spanish was improving. Through this budding relationship, Marcela introduced Connor to much of her family. The day Marcela came to the United States to stay was February 9, 2011. The day was filled with a mix of emotions. She was happy to start a new life in a new place with her soon-to-be husband. She was upset to be leaving her country, the place from where she grew, her home, her family’s home. She was especially sad to be leaving her mother, as they were very close. To make matters worse, her experience with U.S. Customs was less than satisfying. It began when the customs officer analyzed her papers and asked the basic questions. After she was finished with that line of questioning, she was sent to the immigration room for another line of questioning. She reported having been frustrated, because she had done everything right. She had all her papers, she had a valid passport, and this was not her first trip to the United States. She waited in the immigration room for half an hour. Another officer came in and asked the same questions that she had been asked in her previous interview. She answered them again, and was asked to sit again. She waited for another half hour and this time it was a customs supervisor who delivered the same line of questioning yet again. After she answered all of the questions this third time they let her go. According to Marcela, the terrible day with customs was relieved, as it only could’ve been relieved, by seeing her fiance when she finally got to the other side. He greeted her with nothing but love and a bouquet of flowers. Looking back, Marcela mentioned she misses her family and Honduran food. 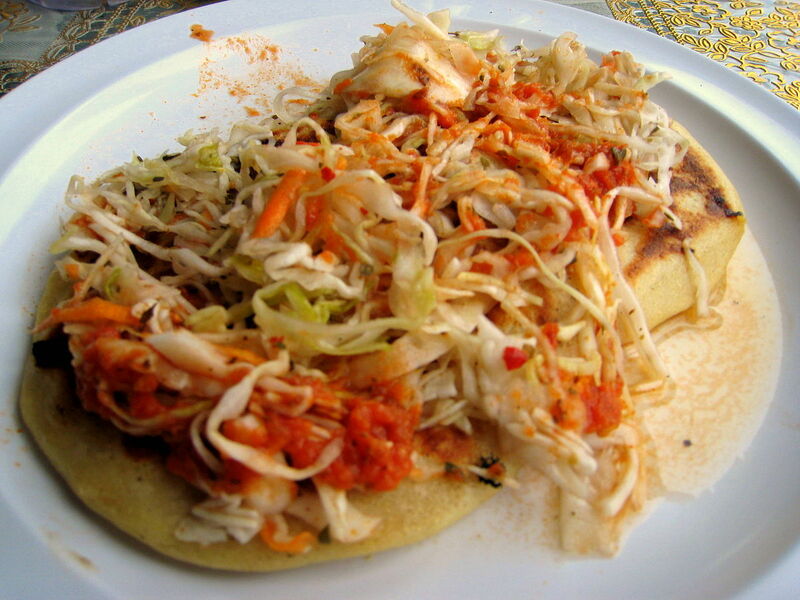 More specifically, she misses pupusas, made with corn dough stuffed cheese and with encurtido ( a pickled slaw of cabbage, vinegar, salt, and sugar) on the top . She misses is especially considering the lack of food diversity in her new home in North Dakota. What Pembina, ND, lacks in good food, it makes up for it in people and community. Marcela mentioned that is what she likes most about her new home. Of course, she also brought some of her old home into her new home, including a photograph from her sister’s wedding, which is important to her, because her late grandmother is pictured in it. From Professor Liang’s Fall 2018 Global Human Rights class. Thank you, DyAnna, for this excellent report on migration. It is so unfortunate to hear what Marcela had to go through in regards to the U.S. Customs debacle. The borders that are placed from nation to nation, city to city, or wherever, is more than just a physical border, it’s also a mental border. The exclusive knowledge that is so rapidly spreading in our current political climate is eating away at our moral grounds. The dignity that is shared among those that “fit” within the society that is comfortable to us, must be expanded to everyone. It shocks me every time to hear Americans complain about “aliens” not speaking English, like as if those that don’t speak English are simply unintelligent. I wonder if Marcela did speak English better, how that would of effected her U.S. Customs experience. I think the answer is quite obvious, unfortunately. Humanity, in my opinion, is at a crux that has the potential to lead us down a path of violence, death, and worldwide suffering. I have hope in the world that this will not be our future, but this can only be saved by us. The question is, how do we find unity and community when our politics is telling us otherwise? Thank you for sharing your sister story, DyAnna. I can imagine your sisters frustration with customs and their suspicion. I am glad to hear she was able to eventually make it safely to the US to be with her fiance. I’m especially relieved to hear she is successfully settling in to her new home, something that must’ve been an immense worry of hers. your sister is very brave to have made such an enormous leap of faith for love and I really admire her ability to follow her heart and take risks for her happiness. Thank you for this post. Stories like these are why the phrase “Truth is stranger than fiction” still holds water today. There isn’t a daytime drama out there that could come up with a story as entertaining as this and still be as powerful. This is something that only happens every once in a blue moon and I am happy that they are married and together in North Dakota. It is a shame that a Marine’s wife was treated with such disrespect, especially when the customs agents could have easily verified before coming to conclusions. This is the time of Thanksgiving and I hope you had a happy one. What a lovely story. It is incredible to me that Connor and Marcela fell in love despite that fact that they could not communicate fully. That very idea challenges our conventional understanding of borders. I can’t begin to imagine how intimidating it would be to move a continent away for a love that may or may not work out. It seems Marcela had the big “pull” factor of love bringing her to the U.S., but did she mention any others? 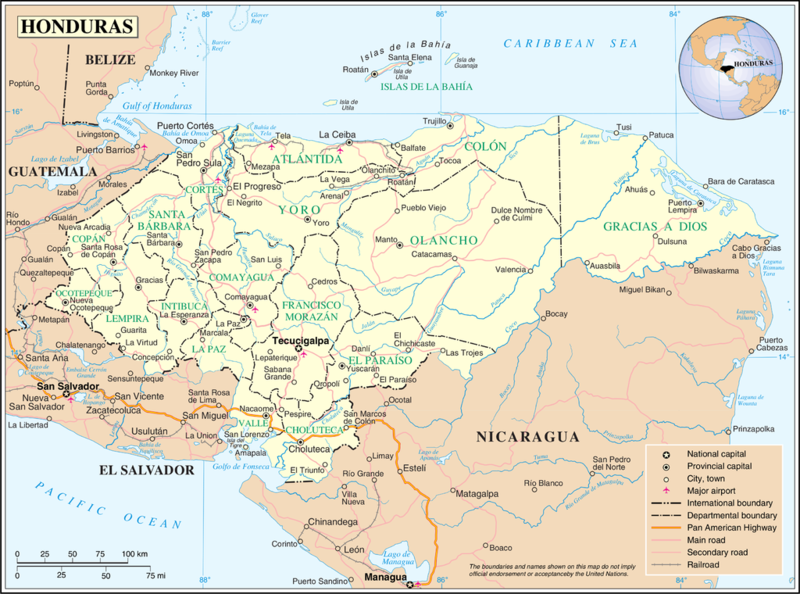 The current situation in Honduras is not the greatest either. Did she say if she felt inclined to leave outside of her relationship with Connor? Thank you for sharing this incredible story. I cannot imagine how frustrating it would be to not be able to communicate with someone you love. This story is heartwarming for the fact that both Marcela and Connor were willing to learn each other’s language in order to be able to communicate with each other. Many of the stories shared on this website often talk about how language can be such a barrier and how lucky we as Americans are. I commend Connor for trying to learn Spanish, because I think a lot of Americans would just assume that it would be the other party needed to learn English. I also can’t imagine how frightening it would have been for Marcela to be questioned so rigorously by US customs. I understand they have a job to do, but I can’t imagine putting myself in her position. Thanks for sharing this story. This is a very powerful testimony to power of love and family. It is hard to imagine making the choice to move to a new country where I do not know the language or culture, but the only thing I am sure about is my love for another person and their love for me. Furthermore, the issues that Marcela experienced at the border happen all the time and are unfortunately a very unfriendly welcome to the U.S. I suppose this type of strict security came in a post-9/11 panic of homeland security. I understand that having national security is important, but I do not like the guilty until proven innocent approach that often occurs in these circumstances. This is a very powerful story that be more broadly applied to ideas of home, identity, and migration. As I have read and listened to many different immigration stories I am continually amazed at the uniqueness of each. It upsets me that someone like Marcela, those who are immigrating to the U.S. of non-Caucasian descent, have to go through ridiculous processes to enter the country. Anyone who is in a relationship with a service member should be treated with the upmost respect and benefit of the doubt. I commend Marcela dearly for being strong and confident enough to make a life changing decision. I am glad that she has experienced the real side of America with her community in North Dakota; hopefully it has made the transition easier than expected. What a beautiful story. I love stories such as these because they remind us of what it means to be connected to people. Even if we don’t know one another’s languages and our cultures are inexplicably different, what connects us together remains. As humans, our core beliefs and aspirations are not much different than we would assume. We want love, family, safety, respect, acceptance. In the discussion of migration, I think these topics can get lost in the arguments, and our universal humanity is forgotten. Furthermore, the sentence from Marcela’s quote, “It’s like your born again even though you are an adult already” perfectly summarizes what it is like to leave your home and establish another one. I haven’t migrated the same distance as Marcela has, but I did move across the state to live with my family. I remember experiencing culture shock because the way I had learned to navigate simple things like going to school and making friends changed. Although I didn’t have to learn a new language or move to another country and face discrimination, I did experience what it was like to feel as though you are on the outside looking in. I remember having to rethink the way I approached things. I think Marcela’s immigration story is admirable and shows a great deal of strength and wisdom. Thank you for sharing this story. It always amazes me what people are willing to do for something that they feel so passionate about. I don’t know how willing i would be to move to a new country with as little as your sister had. I like how this also relates back to the meaning of home that we have talked about in class. Because her home was in both countries and she had to give up one home for another. IT makes me feel horrible fro her how she was treated by the immigration officers, no one deserves to o through something like that, even more so with the valid paperwork. The story you shared on Marcela and her journey for love is truly amazing. I found it very interesting and lovely that even though they could not speak the same language they still enjoyed each others company and fell in love. It is so interesting how even without the use of words actions and expressions can tell how someone feels about another person or situation. Also, I can’t imagine how tough the move must have been for Marcela and for her family that she was leaving behind. Leaving my home country and my family would be very tough but I think in life tough choices and risks need to be made in order to live a fulfilling life. North Dakota must be a very different place to live compared to Honduras and I can only imagine the lack of diversity in food. Lastly, I wish she would have had to go through the struggles at the airport and with customs. It doesn’t seem like a good first impression to give to many immigrants who are looking forward to living or visiting our country. I hope everything works out in this love story and that Marcela enjoys life in America and the challenges that will likely come with learning a new language and place to live. Dyanna, this story is simply beautiful. My impression from it is that love conquers all. Despite all headaches that simply came with moving I am glad that Marcela made it through. Your story simply makes me think of my grandparents. Not only do they get to experience the stress of filling the documents while in Kenya, but I am also simply worried about the journey from Nairobi to Minneapolis. After a frustrating situation, it is satisfactory, that Marcela was able to find an individual that spoke her language. Although this is not the case for many that have to go through airport security for the first time. Simply speculating such experiences may make one feel not welcome. I have been privileged enough to fly from time to time, but I cannot think on a time where my travels were smooth from start to finish. For instance, on a layover in Paris, my family had an issue expressing the problem with our tickets. Therefore, I am worried about my grandparent’s travels, they have never flown in addition they have limited English skills. I wish there were an easier way to travel especially for those that are traveling from afar and are unaware of the customs. Thank you for sharing such a beautiful story. DyAnna, thank you for sharing your story. It reminded me of the migration stories in Professor Liang’s class. When I was interviewing my friend for this, I too learned about how the visa process or U.S. Customs is not always a pleasant place to be. It was shocking to me the attitudes the officials there had towards those wanting to enter the U.S. Your story is very heartwarming because my uncle has ties to Honduras.Your story resembles the strength and courage that a lot of people do not have to the same degree. Wow, DyAnna. This article was fantastic and difficult at the same time (as most love stories seem to be). The most striking thing to me to read, the thing that tightened my chest, was Marcela’s time with U.S. Customs. To first be alienated by repeated interrogation designed to break people under pressure, and then have her luggage thrown onto the floor, is disgusting behavior on the part of officials. There is a difference between securing the country and showcasing one’s dominance (which feels like the case as you’ve told it here); the difference being, of course, that defense doesn’t require degradation of fellow human beings. I was so relieved to know that she was allowed through eventually, but incredibly frustrated that it took the word of an English-speaking, United States citizen in order for her to be believed. What I loved the most about this story is that two vastly different people, cultures, and languages were able to be joined together through dance (a language all of its own). I appreciate that your brother is learning Spanish and it’s not just Marcela learning English. What was your favorite part about writing their story? 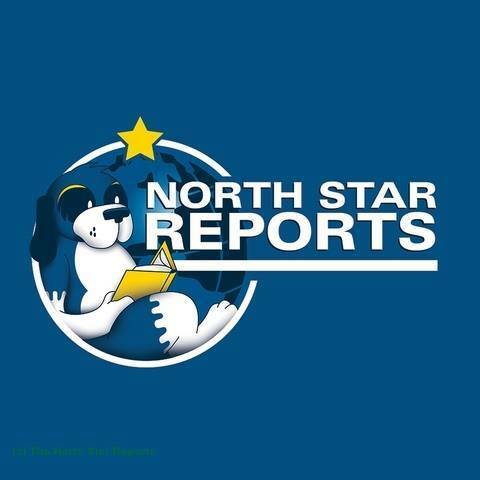 Thank you for sharing this fantastic article. I could only imagine how the man reacted when he saw the Marine uniform fall out of the bag especially because Connor was not with her at the time. Being all alone and having to defend something that looks bad to everyone around her and not being able to fully communicate with the people around you would be incredibly frustrating. Being completely alone while you face interrogation after interrogation in a foreign country would scare me especially when she did nothing wrong. This highlights some of the immense obstacles that so many immigrants face when migrating for a better life for themselves. This was a great story, thanks for sharing! What a beautiful romantic story. Romance is a great driving force and shapes many aspects of history yet remains relatively understudied. Coincidently, my dad was in the army reserves and was stationed in Honduras as well. He also met a beautiful Honduras woman and had dinner with her family. Unlike your story, things never progressed because the language barrier held them back. It is very inspirational and amazing that your sister continued her relationship despite such a dramatic barrier as the inability to fully communicate. Thanks for sharing! What a beautiful story. I read every part of this article so so intently because of how captivating it was. One of the things you mentioned that Marcela said was that sometimes migration changes the way you think. I think that is something that we often brush off but really that may be one of the biggest aspects of migration. The way you think is such big part of who you are and if that changes, how much of you changes along with that? Although she went through some challenges, I am glad she was able to successfully begin a new exciting life with her fiancé. What a beautiful story this is! I must say that I’m really impressed with Marcela’s courage. To take this leap of faith and leave everything behind must have been one of her life’s more scary decisions, and even more so when moving to a country where she would not know the language. I guess that it shows just how strong of a motivator love can be, and how much trust can be developed between people even though the verbal communication is a bit hampered. The treatment she received by the customs officers are disheartening to hear. I would suspect that this is something that would not have happened to someone with caucasian appearance. I could never imagine how frustrating it would be to always have to take into account the possibility of facing discriminatory behavior from officials, even when as in Marcela’s case you have done everything correctly. I assume that we still have a long way to go until this kind of behavior and prejudice is eradicated. DyAnna, I really enjoyed reading this story about Marcela and Connor! I am so amazed and glad that they didn’t let their difference in language stop them from being together. I understand the reasons for great security in airports and am grateful for the safety they provide every time I fly somewhere. But forcing innocent travelers through the experience of intense questioning and searches like Marcela went through is terrible. I’ve heard many stories of other migrants facing similar treatment, and I just don’t understand why that is allowed. I particularly liked what Marcela said about her growth as a person because of the challenges she has faced–I think that is a wonderful perspective to have on life. Thank you for sharing! Wow, this article was so sweet to read and it really shows that love can overcome barriers. The love story between the U.S. marine and a young Honduran women was so inspiring. Personally, I felt that the U.S. customs officer’s did not treat Marcella right from asking her the same questions over and over. It really shows the injustices that immigrants from different countries face when they migrate to the United States. Overall, even with the challenges, she was able to unite with the love of her life and allowed her to grow as an individual. Thank you for sharing this story! I love to read such a powerful story and the romantic side of me is excited to hear about a successful love story. I cannot imagine what it must have felt like to finally make the decision to move away from home and then have to deal with the U.S customs. I am surprised by the way they treated her when they saw the Marine uniforms and I hope they received a consequence. Learning a new language is a lot of work but it is cool that Marcela and her husband can work together to learn each other’s first language. I really enjoyed reading this article. I think it really shows some of the struggles many migrants face. Customs are awful and I can’t imagine having to be questioned, not just once, but three times. That would be extremely nerve-wracking and frustrating to say the least. And not having your culture and food must be really hard. My hometown is very near both North and South Dakota, and I have to agree, there is little for diversity! On a side note, the story of how Marcela and her husband met is really sweet and, like you mentioned, seems to be from a romance novel! Thank you for sharing this story. Sometimes we can forget the positive stories of love and hope that are associated with migration. I am sorry to hear that Marcela had such a difficult time getting through immigration and customs at the airport. This just illustrates how important good policy, and good personnel management is to the process. I am glad that Marcela is enjoying her life here and wish her and Conner great success in the future. What a sweet story of the meaning of home. It sounds like while Marcela has found a new home in ND, she certainly must miss home as well. I’ve had pupusas before of a slightly different type and they were amazing, so I can understand missing them. I find it interesting that she feels community in North Dakota, as I have not always heard it to be as welcoming as other places. Thank you for sharing this story with us. I could see how Marcela would be frustrated with her experience going through customs and immigration, but that proves that the United States wants a strong border and to keep the country safe. But I am very glad that she was able to start her life in the US and be able to experience all of the positive things that she has. Thank you for sharing your story with us, I love to hear when long distance relationships work out. I have had a few run ins with customs not quite to that extent but it really can be exhausting, I can’t imagine speaking a foreign language and going through it. I am from Canada and not close to home and I do miss it, I go home once a year and I could not imagine not having that freedom. I am happy that she made it here safely and can live in the US now. This is such a touching yet frustrating story. It is quite impressive that they have both learned each other’s languages in order to make their relationship work. Oftentimes I hear of English speaking people not making an effort to learn their partner’s language and it’s quite irritating to me. What I find more frustrating however, is how US customs officials are taught to treat immigrants. Usually when I go through customs as a white, American woman, I have absolutely no issues; the customs officials are rarely excited to see me but I still get by unscathed. I can’t imagine what it is like being a Latinx immigrant moving through customs in our current political climate. President Trump has instilled and perpetuated prejudice and fear against Latinx immigrants in a very large number of Americans. Despite this, the couple was able to overcome these political borders and be married which is really beautiful.